If you're new here, you may want to start by perusing my Baby Tips or start here. Thanks for coming! Thanks to all my loyal readers for sharing with your friends. 1. Sometimes I think of how nice to get out of the house and go to work. The thought of leaving the house without the baby would be nice. 2. Long Term Goal Outside of FamilyThe outlet that I choose is this blog and my book 50 Things to Know Before Having a Baby. While I am not doing the exact same work that I was doing before the baby, I love technology, and teaching others. I still found a way to do this. You can't be a Mom 100% of the time. Doing other things will make you a better Mom. I believe starting and exercise routine is very important. I used the Insanity DVD's to get back in shape after pregnancy. I do them in the morning during play time. If our little girl would cry, I could pause them and then get back to it. Believe me I needed the pauses too because the workout is hard. You can't just stay home all day. You should get out with others. I now have church groups, play games at the coffee shop, mothers group, and shopping. Sometimes I love a schedule. I could write every hour of the day down. But when one of us is sick or we do an activity out of the house, many times that schedule changes and that is ok too. I feel guilty to be given the opportunity to be a stay-at-home Mom. I believe some of my other friends would like to do the job if they had the opportunity. The days that I was tired and bored I felt were wasted. But I know that some says I would feel unfulfilled at work and miss our little girl even more. 7. Money- Going from making what my husband made to making nothing felt different. We have savings but we don't have the same lifestyle we did before. We do save money by not going to the bar, not eating out as much, and having different weekend activities. As a stay-at-home Mom I don't pay for Gas, lunch out, new clothes, and dinner out as often. These cost add up over the year that I know is savings. I am lucky that my hobby turned into some extra money for our family. This blog has created an extra income source. I was the first in our group of close friends to have a child. Being and interacting with other stay-at-home Moms is very beneficial to me. Their stories and encouragement have been very positive. Your old friends may change because you are a Mom now (mine did) but you need to interact with other people outside of the house. Taking to other adults is important. And no you can't check facebook all day. You may eventually need some time off. A family member of friend can help you. "It takes a whole village to raise a child". You don't need to be a 100% stay-at-home Mom. You can get a part time job. I thought about becoming a substitute teacher for one day a week. Some daycare will take children for the day. A family friend may need some extra income and would like to watch your child for one day a week. One day I was feeding our baby. She way playing with my face. I loved her in my arms, and the thought of her playing with some other persons face made me realize how much I loved being in that moment. I think being a Mom would be easier if I had more sleep. But I will never know. I believe that some women are better Moms if they work. Different people were put on earth to complete different jobs in this world. When I worked, I would look out the window on a sunny day and would daydream about being outside in the warmth at a park. I can do that now, with out little girl. I love it! If you decide to be a stay-at-home Mom the change is not forever. You can start looking for a job at night or when the child is sleeping. You are not making a forever choice. You may have time time to do things that you would not have the time to do as a working Mom with a family. 19. Priorities- This about what is most important to your family. Then try to get there. 20. Balance- I have found it difficult to create balance in my life as a stay-at-home Mom. I try to balance many things but don't come close. When we make plans God laughs. Be prepared. Before I became a stay-at-home Mom my husband and I had a plan. We had savings. We did not have payment. We changed our bills so are tv, cell phone, insurance, and trash were lower. We decided how to keep paying into my retirement. Keep putting money into a retirement account as a stay-at-home Mom. This is a big life change. You may get depressed for a number of reasons. If you need help find it. Being a stay-at-home Mom may not be the reason you are feeling this way. If you worked you may have negative feelings for another reason. Diapers, feeding, cleaning, crying, over and over and over. I admit to being moody and not completely emotionally stable. A stay-at-home Mom is basically a house manager. Manages food, money, children, and stuff. Each day I try and be perfect but never achieve it. I hear many stories about other stay-at-home Moms. I try to learn from those issues. Some days I feel isolated from the world. When my daughter was sick we could not go anywhere for three weeks because she was contagious. There are only so many places you can go in your house until you get bored of all of them. If you are a stay-at-home Mom someone is probably paying the bills. If this person has to work late then you need to work late too. Getting out of the house is more difficult. You need to pack the diaper bag, carry the baby, know what kind of mood the baby is in, ect. When I went to work I liked to wear long necklaces and earnings. As a stay-at-home Mom I rarely wear these because someone likes to play with them and pull them. Instead of telling her no, I like to just not wear them to begin with. Keeping healthy food around the house is not important for just you but the family. I believe when I weigh less I can do things around the house more efficiently. My husband and I also get sick less. I believe keeping organized is important. Meal planning, organized clothes, organized drawers, and a laundry system are all helpful as a stay-at-home Mom. As a stay-at-home Mom you have your entire kitchen next to you most of the day. If there is bad food in they cabinets for example chocolate, chips, ice cream, I will eat them. I try not to keep these things in the house. I learned this phrase in my Woman's bible study last week. This is something I need to remember especially when I am tired. I try to remember the difference between needs and wants. When I became a stay-at-home Mom I began to get rid of many items in my house that I did not need. This was very freeing. I am given what I need as a stay-at-home Mom. Just being around our little girl keeps me in the present moment. What am amazing feeling to feel content and happy. A never ending cycle. The more help I can get in these areas the better. Many days you may feel isolated. You may not be around other talking adults for entire day until your significant others gets house. That person may be so tired that they may not want to talk to you either. You may forget to shower, brush your teeth, or hair. While you can wear the same thing all day, you may not want to wear the same thing all week. Just like any job, you are not your title. Getting praise for doing something may be difficult. Much of the work you do may not be appreciated for a long time. You may feel amazing amount of joy in your life some days. I think this is why people plan to have more than just one child. You may get small beaks because your child is napping. But they are usually not on schedule and you may not know the length of the break. An amazing feeling to love someone all day long. 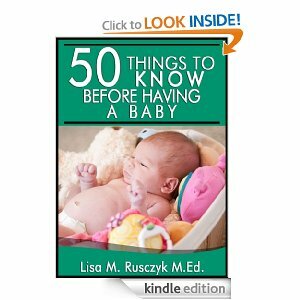 To read all 50 tips view 50 Things to Know Before Having a Baby eBook. A great baby shower gift for a friend who is pregnant! Also a great book for people that are thinking about having a baby. I ENCOURAGE YOU to borrow the book for free from the Kindle Lending Library for Amazon Prime Members. If you want the book for free or would like to share these tips please email me at lbrennec@gmail.com. You can also give this quick read as a gift to a friend or family member as a paperback book. Lisa is the creator of the blog Charlie-The-Cavalier and His Friends, Family, and Home. 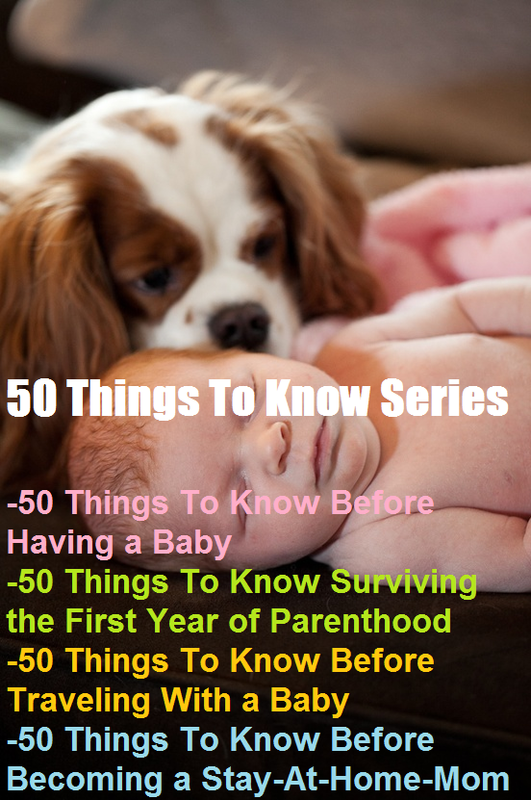 She is also the author of 50 Things to Know Before Having a Baby and 50 Things to Know.com. Send Lisa Rusczyk and email at lbrennec@gmail.com. The Insanity Workout is how I lost the baby weight and got back to my high school weight. These workouts are great to keep you motivated to exercise while taking care of a baby. I could just pause the DVD when I wanted to feed/change/play with the baby. I also planned and portioned food ahead of time with these organized storage containers. A great option if you are pregnant are these monthly workout DVDs. Each month has a different workout. #2 on the Top Ten Books For Expecting Parents on GoodReads! 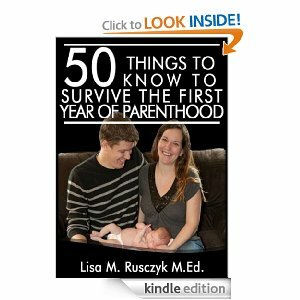 This is a collection of 50 simple tips that any soon to be parent would like to know before their first year of parenthood. A great quick read for a soon to be parent. 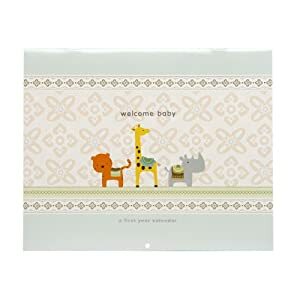 The book also includes tools including Website Resources, Baby Feeding/Diaper Schedule, Mom Medicine Schedule, Baby Clothes Size Chart, Baby Sitter Sheet, Short Hospital Bag Checklist, After Recovery Kit, Baby Medicine Basket Items, and a list of 10 Things to Know When Traveling with a baby.